Discussion in 'Traditional Folders and Fixed Blades' started by Gary W. Graley, Aug 8, 2013. In the mean time, here are some images of the pair, with a blade only 1 mm thick at the spine, even dull you could hurt yourself! Quite the wicked blade shape and the handle is pretty comfy, great for food too, used the Ebony several times with nice working there. Nice pair! I love olive wood - and that's a nice specimen. Thanks to you, I just put a No. 10 slim olive in my shopping cart. This is why my wallet hates me (even if only a little). those are absolutely gorgeous G2, i am really digging that blade shape, not to mention the deep dark hue of that ebony and the contrasting olivewood grain. Very nice Gary, I really like olive wood. Just picked up an Opinel #8 Ebauche in olive wood. Wish it was offered in carbon steel, but I'm looking forward to seeing how it turns out. Beautiful knives, Gary! Excellent pictures as always! 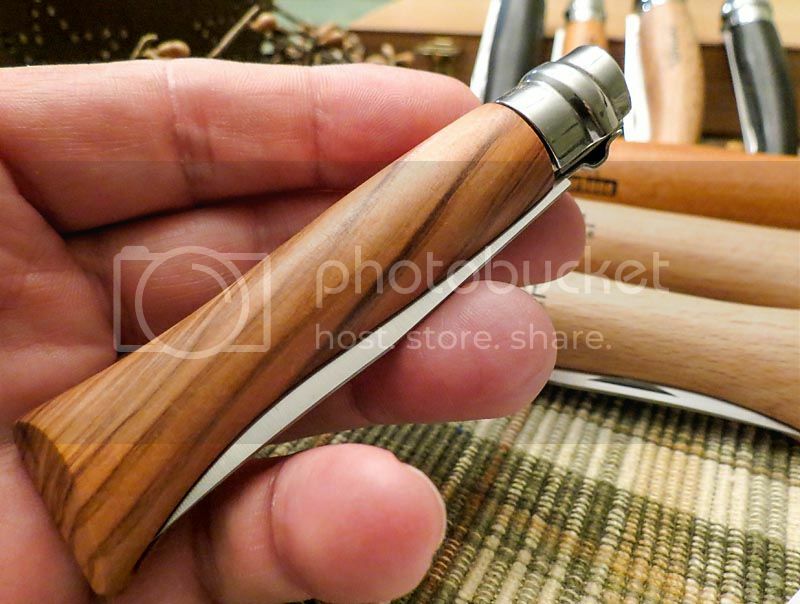 I just may have to pick up one of those, as I'm a sucker for olivewood. I've had the No. 8 Garden Knife as my EDC for almost 5 years. The grain pattern isn't as lovely as that, though I wish it were, and the finish is satin rather than polished. It's due for a sanding and refinishing in the next month or two... what other $15 knife can get you so excited about renovating it? As a tree-hugging New Englander, I'll point out that the Olivewood handle creates jobs and saves traditional olive groves in southern Europe, some of them pre-dating the discovery of the Americas. Ebony is rapidly going extinct due to unregulated harvesting, and it's kind of boring next to the olivewood anyway. Congratulations for the newest member of your French Quarter! I hope your index finger heals quickly. Opinels can get scary sharp. I have never handled an ebony knife yet. Olive wood definitely feels quite harder compared to the regular beech wood, which is not a soft wood itself to begin with. The ebony wood makes this knife really elegant, it transforms it to a true gent&#8217;s knife. Thanks for sharing your review. An assortment of Opinels are now on my want list. The Olive Wood looks so nice! Here's a pic of my #6 olivewood, they told me not to lose this, as it's pretty rare to get a burl olivewood handled one, I'm happy ! Thanks for sharing, I've got the hankering for one now. That Ebony looks exceptional, as does the Olive wood. I think it'd make a great fishing knife, seeing as it could be used for making fillets. 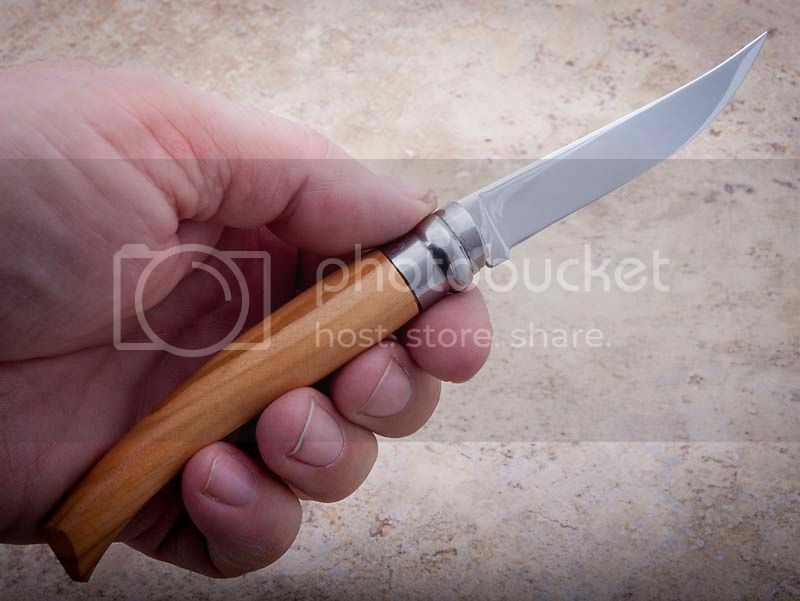 Well, I'll warn you guys about the Opinel's you'll want to apply some Vaseline or the like at the pivot end, as any water gets in there and you either have a knife you can't open, or a knife you can't close, until it dies down from the swelling. At least on the Beech ones, I put that on there and it's been all good, but, I do pay attention when using around wet conditions! A pair of bent-nose, outward-open snap-ring pliers makes it real easy to get the collar off and apply lube to the pin and pin-hole. $5 or so at the Harbor Freight, worth it if you develop an Opinel habit. I really wish the exotic and limiteds were offered in carbone. Yup. (And in plastic, a la the Svord Peasant). Until then, the beech spiffs up nicely. 80 grit sand paper, stain or dye, top coat of choice. Those are some really nice Opi's! 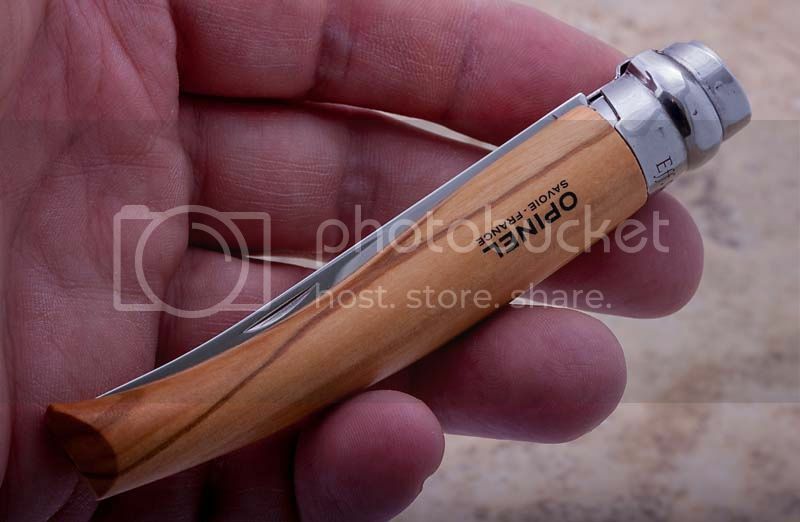 Note to myself: get an olivewood opinel. One of my sons has two No.10 slim Opinels; familiar with them, I was surprised at-- and pleased by-- the comparatively "foreshortened" dimensions of a slim No.8. Of the two, I prefer the #8. ...the Olivewood handle creates jobs and saves traditional olive groves in southern Europe, some of them pre-dating the discovery of the Americas. I think a synthetic handled Opinel, is overdue. I'd love to have one for more serious use.